The lesser-known sibling of the much revered stand-up comedy, improvised comedy has garnered a loyal crowd of Capetonian comedy fans with its spontaneous nature and rollercoaster roars. For improv comedy group The Long Shots, the laid-back and rustic atmosphere of The River Club’s Players Restaurant has recently become the home for the non-scripted and free-falling production of the long-form improv vein. Ringmaster Jason Delphanque presides over an energetic team as they produce a series of on-the-fly sketches which move far too fast to ever fall flat. The premise involves two performers being ‘stuck’ on stage at any one time with another improviser coming at them with various games and scenes in which they must participate. There is no break for the targets as the predator surrounds them, a fact which undoubtedly heightens the thrill of it all. Only sheer smarts, wit and instinct can save them. Naturally the production does not lack variety in setting at all – while I watched we were shifted rapidly from the Wild West and beer-swilling cowboys and saloons, to urban Paris and posh egocentric assassins. Primed as the show is for the unexpected, one of the biggest and devilishly tasteless laughs came after the introduction of the homely and simple-minded Jasper, portrayed by Andre Ballot, who provided a bonanza with his ‘aw shucks’ vibe, and his extraordinary relationship with his narrow-minded girlfriend played by the hilarious Robin Hitchcock. Action fanatics got a huge treat with the Gallic femme fatale ‘Josephine’. Stereotypically French complete with rolling guttural grunts, Josephine and her sidekick cracked their own deadly veneer with goofy inefficiency as they prepared for a hit. This duo of Eva Gilliam and Marcel Oudejans might just have delivered the most memorable sketch of the night. Improv comedy is raw and spontaneous, but can at any time descend into a messy heap. One performer may corpse leaving his co-stars to salvage the scene, but with The Long Shots, the feeling is that this would be unlikely. This is a team where each of the members displays a distinct sense of comfort with the next, allowing an effortless flow of elements and details to creep into scenes riddled with captivating mental and physical gymnastics. The freedom of the show is remarkable, and it encourages audience members – newbies and regulars alike – to participate. Immensely satisfying, The Long Shots troupe braves the spontaneity of comedy with glorious and infectious abandon. 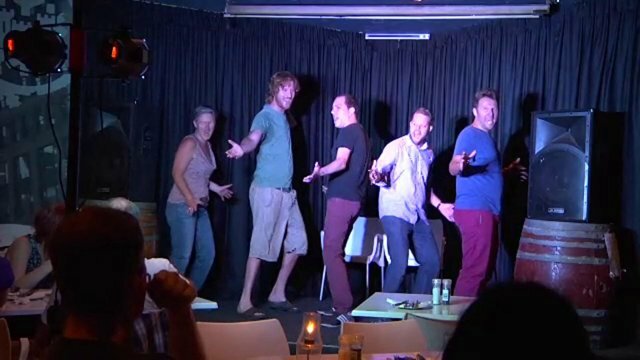 The Long Shots Improv Troupe performs at The River Club’s Players Restaurant on the fourth Thursday of every month from 7.45pm until 10pm. The Long Shots troupe also hosts a regular drop-in class once a week. See the Long Shots Facebook page for details.